Google today said it has learned a lot from the Feb. 14 accident involving one of its autonomous vehicles (AVs) -- especially about driving on busy arteries like the one where the incident took place. The accident happened on Valentine's Day on El Camino Real, a wide boulevard consisting of three lanes in each direction that runs through Google's hometown of Mountain View, Calif.
"A public transit bus was approaching from behind. The Google AV test driver saw the bus approaching in the left side mirror, but believed the bus would stop or slow to allow the Google AV to continue," the accident report said. "Approximately three seconds later, as the Google AV was reentering the center of the lane, it made contact with the side of the bus." While no injuries were reported, the Google AV sustained body damage to the left front fender, the left front wheel and one of its driver's-side doors, the accident report stated. 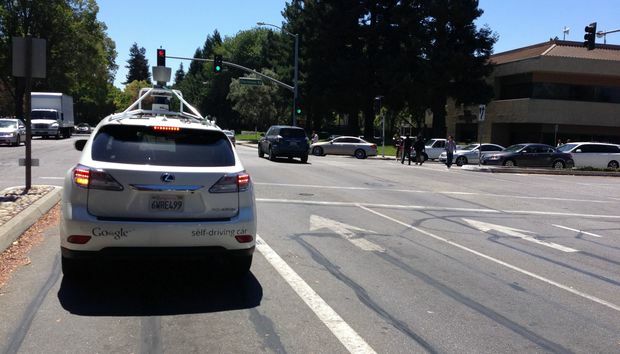 In a reply to Computerworld questions, Google said its fleet of AVs spend a lot of time on El Camino Real, a boulevard that has "hundreds of sets of traffic lights and hundreds more intersections." Along with an in-house vehicle that has no steering wheel, Google has 23 Lexus RX450h SUVs performing test drives on California public roads. To date, the vehicles have logged more than 1 million miles, according to Google. Most of the time Google's AVs drive in the middle of a lane but "when you're teeing up a right-hand turn in a lane wide enough to handle two streams of traffic, annoyed traffic stacks up behind you. As the SUV approached the turn, it detected sandbags near a storm drain blocking its path, forcing it to stop. After waiting for some other vehicles to pass, the car -- still in autonomous mode -- began angling back toward the center of the lane at about 2 mph. That's when it crashed into the side of the bus. The test driver, who had been watching the bus in the mirror, also expected the bus to slow or stop, Google said, "and we can imagine the bus driver assumed we were going to stay put. "Unfortunately, all these assumptions led us to the same spot in the lane at the same time. This type of misunderstanding happens between human drivers on the road every day," Google said. This is the first time Google has acknowledged some responsibility for an accident involving one of its autonomous vehicles. The accident, Google said, is a classic example of the negotiation that's a normal part of driving: "We're all trying to predict each other's movements. "In this case, we clearly bear some responsibility, because if our car hadn't moved there wouldn't have been a collision. That said, our test driver believed the bus was going to slow or stop to allow us to merge into the traffic, and that there would be sufficient space to do that," the company added. Google said it has reviewed this incident, as well as thousands of variations on it, in a driving simulator and made refinements to its AV software. "From now on, our cars will more deeply understand that buses (and other large vehicles) are less likely to yield to us than other types of vehicles, and we hope to handle situations like this more gracefully in the future," Google said.